As part of Rountree Brady’s community program, a new charity campaign is now active, in support of local firefighters’ effort to fight cancer. Understanding the health risks firefighting poses, Rountree Brady decided to join efforts with Firefighter Cancer Support Network to raise funds for assistance and mentoring of firefighters who are battling this deadly illness. We understand that these brave men and women risk their lives every day when they go to work, but cancer is something that many don’t realize is included in these risks. Local insurance agency Rountree Brady Insurance Agency celebrates the beginning of a new charity campaign as part of its ongoing Community Program, now looking to raise funds for the Firefighters Cancer Support Network. The agency announces that those with a heart for supporting the cause can now join the agency’s efforts by contributing through the designated donations page on the agency's website. 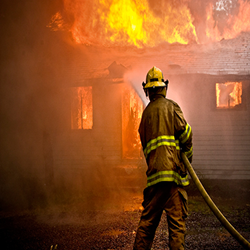 Cancer is the most dangerous threat to firefighter health and safety today. Cancer caused 60 percent of line-of-duty deaths for career firefighters between 2002-2014, according to International Association of Fire Fighters data. The U.S. Fire Administration's firefighter fatality statistics do not include cancer-related deaths, but it's a stark reality: Firefighting increases cancer risks significantly for every firefighter. “We understand that these brave men and women risk their lives every day when they go to work, but cancer is something that many don’t realize is included in these risks,” says Jeff Brady, the agency’s Vice President. The agency has set a goal of $500, and to achieve that goal, the agency’s network of customer and business partners, along with friends, family and neighbors are being invited to participate by not only contributing financially, but also by helping spread the word to others. Rountree Brady Insurance Agency continues to utilize its own resources and networks to ensure the success of their community program. The current campaign is being promoted through the agency’s social media channels, email communications, as well as through their monthly magazine, delivered to thousands of households in Georgia. In fact, Our Hometown magazine reserves a full page to feature this worthy cause, including all of its details. The electronic Flipbook version of the current issue can be accessed here: http://www.rountreebradyinsurance.com/Our-Hometown-Magazine_41. Rountree Brady Insurance Agency will continue to work with individuals and nonprofits in the area to identify new causes to support to strengthen the local community. Through the agency’s website, any members of the community can also submit information on known families or persons who could use some help – http://www.rountreebradyinsurance.com/Add-Community-Cause_47. The elected worthy causes are contacted by a representative of Rountree Brady’s Community Program. More information regarding past and current campaigns supported by the agency can be found on their Community Cause Program page at http://www.rountreebradyinsurance.com/community-cause. The Rountree Brady Insurance Agency is co-owned by James M. “Mickey” Rountree Jr and Jeff Brady, and with their thorough knowledge and understanding of the people in the community they are able to provide customers with an outstanding level of service. Mickey, Brady, and the agency team look forward to helping local families protect the things which are most important to them: families, homes, cars, and more. They can also help clients prepare a strategy to achieve their financial goals. To contact an expert at Rountree Brady Insurance Agency, please call (912) 356.3815.